"warm powerful tenor voice, charismatic, easy going rapport with audiences and outstanding repertoire"
Celebrated Argentine Tango singer, Martin Alvarado, returns to the UK from this week for a second tour bringing his unique brand of tangos, milongas and canciones to venues around Britain. The "Así Es Mi Tango" tour starts on Thursday 1st March in London and then travels around England delivering 9 concerts in 11 days (full details below) with three dates in London and others in Lincoln, Manchester, Chesterfield in Derbyshire, Brighton, Southwell, in Nottinghamshire, and Leominster in Herefordshire. This is a rapid return for Alvarado, following on from the recent success of his November 2011 debut solo tour where he garnered much praise from public and critics alike. For part of the March 2012 tour, he will be joined by his special guest from Finland, Mikko Helenius, on piano and bandoneon (an Argentine button accordion), and the dates will form part of Alvarado’s 21st tour of Europe, which also takes him to Finland, where he took part with Helenius, in the prestigious SibaFest event at the Sibelius Academy in Helsinki on January 28 and 29, Russia and Spain. Alvarado also made an impact in the UK earlier last year with performances in Midnight Tango, the hugely popular stage show starring Vincent and Flavia, of the BBC’s Strictly Come Dancing fame. Alvarado is renowned for his warm powerful tenor voice, his charismatic and easy going rapport with his audiences and his outstanding repertoire which features tangos and Argentinean songs that have a highly poetic quality and timelessness, often within a romantic or emotional context. Some of them are tango classics, and others have been rarely recorded and almost forgotten. 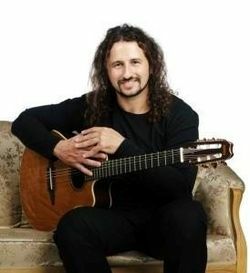 He takes great pride in presenting Argentina’s rich musical heritage to new audiences across Europe, where he has won wide acclaim. In his own country, he is increasingly being seen as a leading ambassador for Argentinean culture across the world and a significant influence in the development of the genre. He strongly believes that tango is a living language which has to evolve and remain relevant so, with his choice of repertoire and the particular modern way he phrases his songs, he brings to it a contemporary and creative sound, but one which remains, at the same time, universally accessible. Joining him in his artistic mission for part of the UK tour, is Mikko Helenius, an exceptionally accomplished pianist and bandoneon player, who has the remarkable and unique ability of being able to play both instruments simultaneously. Together they have a highly intuitive musical relationship which allows them to experiment and explore the music in an often improvised manner, creating wonderful new arrangements for familiar pieces. Alvarado discovered his talent to sing at the age of 19 while studying guitar in Buenos Aires. A few years later he travelled to Spain where he was spotted singing Barcelona and invited to perform in Finland, where tango is a hugely popular activity. News of his talent quickly spread and within two months of arriving there, he was performing with the Tampere Filharmonia orchestra. Since then he has had numerous TV performances in Finland, Russia and Argentina and collaborated and performed with renowned Finnish tango quintet Otra Vez as well as some of the leading musicians in the genre in Argentina, including the highly revered bandoneon player, Leopoldo Federico, who was a guest performer on his second album, “Asi Es Mi Tango”, and Horacio Avilano, a prominent guitarist who worked with him on his last album “Más Allá”. In 2008, he starred in the cutting-edge "El concierto del Nuevo Tango” with internationally-renowned conductor Patrick Gallois, Otra Vez and symphony orchestras and, separately, with Finland’s celebrated UMO jazz orchestra. In 2009, he took part in Astor Piazzolla's tango operita "María de Buenos Aires" on its first Polish version and several times in Finland. He will be performing in it again in Finland in July this year. As well as appearances in Midnight Tango this year, 2011 also saw him perform “Las sombras del desamor” on Finnish TV, as the official song for the "Tangomarkkinat" festival (a kind of hugely popular X-Factor style TV competition for tango singers in Finland) and “Cumbre Mundial del Tango" 2011, a major world tango festival. The song, unusually for a tango song anywhere in the world, reached the Finnish top ten after his TV performance with Finnish singing star Johanna Debreczeni, with whom he will sing in Spain in February. His albums "Martin Alvarado" (2003), "Asi es mi tango" (2006, with Leopoldo Federico as special guest star), "Tango Norte, Tango Sur" (2008, made in Finland with Quinteto Otra Vez) and "Más Allá" (2010, recorded with Horacio Avilano and his trio) have earned Alvarado worldwide prestige. He is currently working on his fifth album with Horacio Avilano and sixth album with Mikko Helenius. "The authentic voice of Argentine tango" - 2×4 Radio, Buenos Aires. "Tango is lucky not to have lost Martin Alvarado to opera" - Aamulehti newspaper, Finland.